October 3, 2018, marked the 10-year anniversary of an important milestone in US behavioral healthcare. On that day a decade ago, the Paul Wellstone and Pete Domenici Mental Health Parity and Addiction Equity Act of 2008 (MHPAEA) became law. Since taking effect on January 1, 2010, the MHPAEA requires most group health plans that cover physical and mental health to provide parity between them: this means beneficiaries should receive the same level of coverage for behavioral (mental health and substance use disorder) services as for medical and surgical services. Prior to the MHPAEA, behavioral healthcare was often covered at lower levels than non-behavioral healthcare, with higher financial requirements (such as co-pays, coinsurance and deductibles) and more stringent treatment limitations (such as number of visits and inpatient days). Under the MHPAEA, financial requirements and treatment limitations must be the same for both behavioral health and non-behavioral healthcare. Drawing on our database of billions of private healthcare claims—the largest in the country—our organization has conducted our own analyses of behavioral healthcare trends since the MHPAEA became law. While we are not able to say with certainty what effect the law had on these trends, our findings open up avenues for further research. The largest increase (202%) occurred from 2010, when the MHPAEA took effect, to 2011. Thereafter, growth was less sharp. This pattern is similar to that found in a study of cost and utilization changes in Alabama related to the Children’s Health Insurance Program (CHIP), which, since 2009, also has been subject to the MHPAEA. 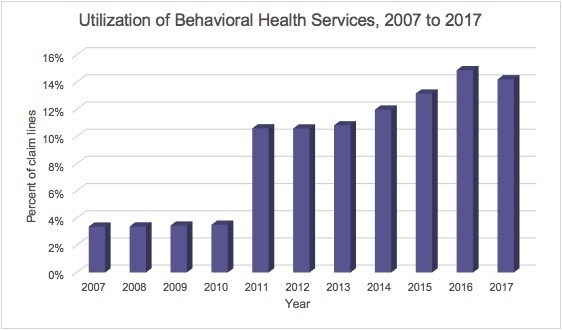 There, the authors found that cost and use increases from 2009 to 2011 suggested pent-up need for behavioral health services, resulting in a temporary spike that then subsided. To identify changes in costs, we developed the Behavioral Health Index, an index of billed charges for behavioral health codes such as current procedural terminology (CPT) code 90837, a 60-minute psychotherapy visit. 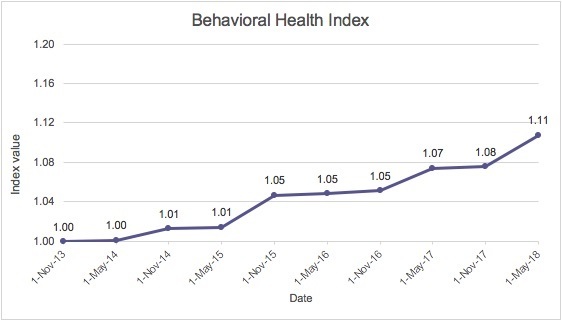 From November 1, 2013, to May 1, 2018, the Behavioral Health Index increased 11%, from 1.00 to 1.11. As a point of reference, our professional-based evaluation and management (E/M) index, which includes codes such as CPT 99213, a 15-minute office visit for an established patient, had a notably higher increase, 22%, during a similar length of time (May 1, 2012, to May 1, 2017). 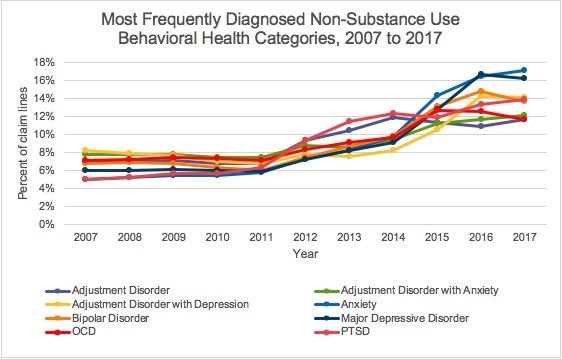 Claim lines for the most frequently diagnosed behavioral health categories all increased from 2007 to 2017, but at different rates. Among the 8 most common diagnostic categories not related to substance use, claim lines associated with anxiety increased the most—242%. Close behind were post-traumatic stress disorder, at 177%, and major depressive disorder, at 172%. Claim lines for bipolar disorder increased 103% during this period. Claim lines with diagnoses of adjustment disorders, including those with anxiety and depression, increased, on average, 65%. Obsessive-compulsive disorder also increased 65%. During that period, the increase in claim lines for amphetamine use was particularly high, at 3157%. 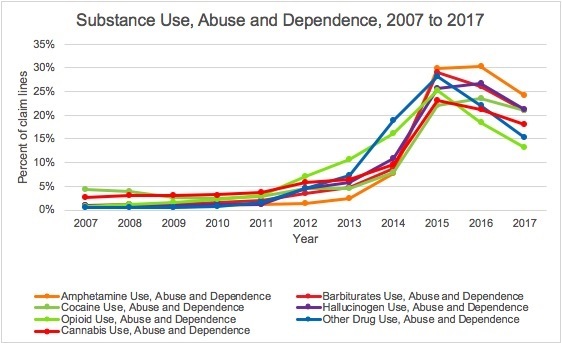 Claim lines associated with barbiturate use diagnoses increased 2233%, and those with hallucinogen use diagnoses 2055%. Claim lines for cannabis use grew 585%.